Home » Food and Nutrition » Natural Foods » The Magnificent Mango Peel! The mango is a delicious fruit that is readily enjoyed the world over. The mango skin, on the other hand, is often discarded without a second thought. This is a shame since mango peels offer a delightful array of nutrients and health benefits to anyone who chomps down on one. Although a bitter and tough meal, mango peels are perfectly edible and will readily reward anyone who tries them. A mango peel contains many of the same nutrients as the flesh and some of them are in even higher quantities than the main “meat” of the fruit. Why then, would you bother eating the peel instead of a few extra mango slices to make up the difference? Sugar. Vitamin A: Vitamin A s an important nutrient for anyone who wants strong eyes and a healthy immune system. Vitamin C: Vitamin C helps in wound repair, the absorption of iron, and the growth and restoration of skin, tendons, ligaments, and blood vessels. Vitamin C is antioxidant-rich, meaning it’s able to sweep up any free radicals bouncing about before they can cause too much trouble. 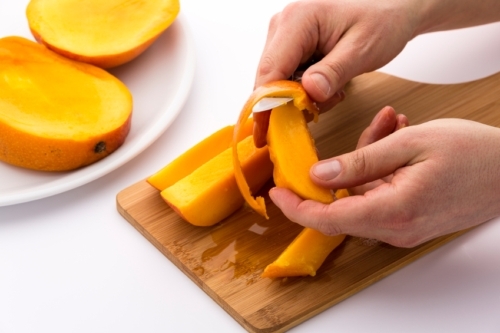 Fiber: Fiber is a big consideration when it comes to mango peels. Like with most fruit, the fiber content found in the rougher skin dwarfs any found in the flesh by a significant margin. Mango peels can add much needed mobility to your digestive system and help keep bowel movements comfortable and regular. Phytonutrients: A fruit’s peel is filled with special nutrients that are meant to protect against insects, fungi, and other annoyances that could threaten the plant. Although many of these phytonutrients are not used by the human body directly, they do have antioxidant properties that can help lower cholesterol and reduce your risk of cancer. Of specific note is a phytonutrient called mangiferin, which is highly available in the peel but only has trace amounts in the flesh of the fruit. Mangiferin is known to be a powerful antioxidant capable of easing inflammation and protect against UV-damage and skin cancer. Wait—Are Mango Peels Even Safe to Consume? There is a common belief that the skin of a mango is not safe to eat because it contains urushiol, the active chemical behind poison ivy and oak. Mango trees are part of the same family as these less-than-edible plants and they do contain some amounts of urushiol, but this is not normally an issue. The reason is because the mango’s urushiol is most concentrated in the tree sap and in the stem, neither of which are eaten as part of the peel. Having said that, people who are sensitive to urushiol may still develop an allergic reaction from a mango peel but there is an easy way to tell if this applies to you. Pick up an unpeeled mango with your bare hand. Are you developing a reaction? If not, then you’re good. So, you’re interested in getting the nutritional benefits of a mango peel and you’ve confirmed that you’re not sensitive to urushiol. The last step between you and better nutrition is the fact that a mango peel, quite frankly, tastes terrible. Smoothie: Cut up an unpeeled mango and blend it together with other fruits and ice so you can make a nice smoothie. This method works best when you use thinner-skinned breeds of mango along with ones that are at their ripest since that’s when the skin is thinnest too. Feel free to mix in other flavorings and ingredients as your taste buds prefer. Chips: Peel a mango and chop the skin up into pieces, then either sun-dry or oven-bake them to make crunchy chips. In addition to being a nice finger food or snack, you can use them with your favorite dip for extra flavor. Pickling: Believe it or not, mango skin can be pickled in brine much like a cucumber. Once accomplished, you can use the result as a topping, ingredient, or stand-alone snack, just like a real pickle. Zesting: A mango skin can be grated to produce a zest for infusing salads, smoothies, and other dishes. How successful this is will depend on the thickness of the peel, so not all mango types will zest the same and your mileage may vary as a result. Straight: It’s possible to eat a mango without bothering to peel it. This approach is not for everyone’s taste, but can be tried to see if it suits yours. Extracts: Mango peel extracts are another option for bypassing preparation methods. By purchasing an extract you can add the benefits of mango peel nutrition to a variety of snacks and meals. Or you can even double-up and add extra extract to a mango peel smoothie. When choosing your mango you should ideally go with organically-grown and pesticide-free fruits. This is because the skin of the fruit is where most pesticides and other chemicals will collect and linger. While it is possible to wash a mango and remove some of the toxins, it’s always best to err on the side of caution and go with what you know to be safe. Enjoy! Banana Peels Can Treat Acne and More! “5 Nutritious Produce Peels You Can Eat,” Reboot With Joe web site; http://www.rebootwithjoe.com/nutrients-in-produce-peels/, last accessed December 14, 2015. “Analysis for Mangos,” Nutrition Facts web site; http://nutritiondata.self.com/facts/fruits-and-fruit-juices/1952/2, last accessed December 14, 2015. “Fruit Peel Nutrition Facts and Health Benefits,” NutritionAndYou.com; http://www.nutrition-and-you.com/fruit-peel.html, last accessed December 14, 2015. “Will Mango Skin Give You a Poison Ivy Reaction?” About.com; http://chemistry.about.com/od/foodchemistryfaqs/f/Can-You-Eat-Mango-Skin.htm, last accessed December 14, 2015.